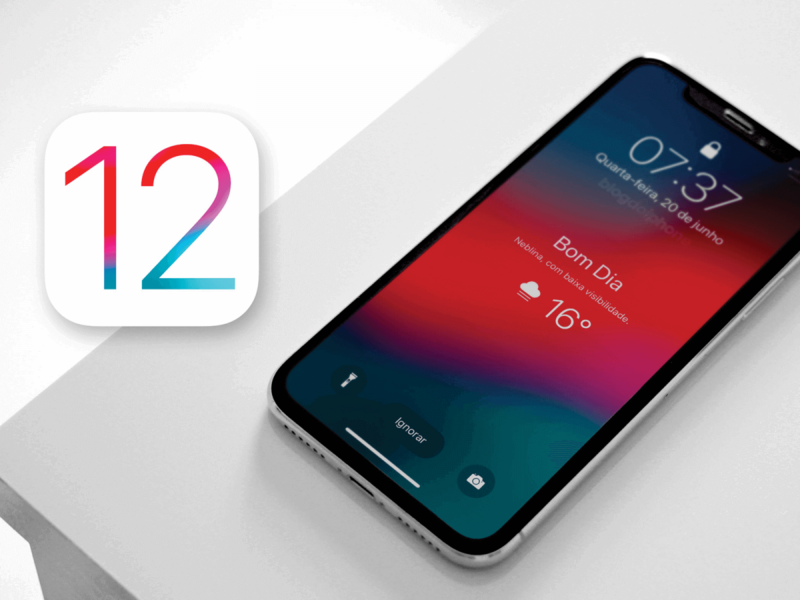 Apple unveiled its next-generation operating system iOS 12 at the Apple Worldwide Developers Conference (WWDC) in 2018, in San Jose, California. Public beta can be installed. To download the beta, go to beta.apple.com while on the iPhone, iPad, or iPod Touch and tap “Get started.” User will then be asked to enroll their device which will require signing in with user Apple ID. Afterward, user have to download the configuration profile. Know the fresh features that comes with iOS 12.
iBook got a new design, and a new name which is now Apple Books. New feature called “Reading Now”, which let user pick up where user left off. In Stocks, business news headlines will appear within the app, allowing user to click and see the full article without leaving Stocks. News has had a redesign to make it more suitable for iPad use. It gets a new Browse tab, which makes it easier to favorites. And there’s a new sidebar. Apple has also updated the Voice Memos app with availability on the iPad. The app added iCloud support, allowing you to sync your recordings across all Apple devices. With ARKit 2 Apple launching a major component of the new Operating System which contains new file format for Augmented Reality, called USDZ developed with Pixar. This suggests developers and designers can create an AR experience in the new format, it can be sent via Mail, loaded to the websites, shared across system and so on. ARKit will allow shared experiences. In AR games, for example, two players separate iPads will be able to separately observer the game play from their viewpoint. AR content will now appear in the News app – user will be able to tap to zoom in, manipulate the object in 3D and so on. Maps will look better – although this isn’t a visual overhaul, apparently comparing to Google Maps. Users will see more detailed images as Apple will be using the data gathered from the vans in conjunction with satellite images. With improved portrait lighting the camera now generates a mask when it detects a person in order to separate the person from the scene. Moreover, users now able to import RAW-format photos from the computer and camera with iOS 12 onto the iPhone and iPad. Users have the ability to edit the RAW image files on their iPad Pro. Easier access to the QR code allows users to swipe into the Control Center and tap the tile to launch the feature. New features in iOS 12 designed to limit distractions, focus on the things that are important to users. With Do Not Disturb activated, users won’t see all notifications during the present bedtime hours. With added feature which includes automatically end Do Not Disturb in an hour, at the end of the day or at the end of meeting on the calendar. FaceTime supports video and audio with up to 32 people at once. The tile of the person speaking will get larger automatically, so user will never lose track of the conversation. User can start Group FaceTime directly from a group thread in Messages or join an active one at any time. FaceTime is encrypted end to end for both one-to-one and group calls, so the conversations remain private and viewable only by the participants for security. The changes to Messages revolve around Animoji. The new Animoji contains T. Rex, Koala, Ghost and Tiger. Animoji can record clips of up to 30 seconds. Customization of Animoji where user can adjust nearly endless options to make user Memoji comparing to Samsung’s AR Emoji. Just as screen time gives user more insight into how user uses the devices, notification management in iOS 12 gives user new ways to reduce disturbances throughout the day. User can manage the notifications in real time from the Lock screen via grouped notifications which contains Siri notification suggestions and makes easier to look into what’s important at a glance. To preserver battery life, CPU performance also ramped up to its highest state for performance and be ramped down just as quickly save battery life. Improved animations, when transitioning from one app to the other, the transition animations are smoother and faster than they are on iOS 11. The performance gains are about optimizing the system when under load. Apps launch up to 40% faster, the keyboard comes up 50% faster display. Sliding to take a photo in Camera is up to 70% faster. Advanced search in Photos is being updated for iOS 12. Intelligent search suggestions even before user completes typing. It also tries to predict what photos user would like to share. Event search with multiple keyword search gives indexes for millions of events, and user can use this to find photos user took at particular event. There’re memories and shared have been combined into a new tab called for user, which opens up a slot on the bottom bar for a search tab. With iOS 12, there are a variety of new password features. For developers specifically, the new Operating System will be able to show passwords from third-party password manager apps in the Quick Type suggestions on the user’s device which is using a new Password Manager API. Apple has updated security on creating passwords. If user is creating password that user have already used on another account, it will be flagged and remind user not to reuse a password. It will automatically create a strong password for user and store it in user’s Keychain. iOS 12 provides Screen Time reports which gives a weekly activity summary that tells user how much user used iPhones or iPad during day and night, and how much time spent in each app. It also tells user which apps send the most notifications. User will presumably not allow extensions when creating app usage allowances for kids, and stipulating downtime. With advanced parental control, it’ll be easier to give access for children followed by app limits by categories or set apps that can always get at – the Phone app, mostly educational apps. New shortcuts app creates or customize users’ own shortcuts to run multiple steps at once. For app developers, it’ll be more manageable to work with SiriKit API to run shortcuts. Siri will now more “helpful” in the food knowledge and any Passwords that user might not remember. CarPlay navigation comes with ultimate copilot which makes it smarter, safer way to use iPhone in the car. The battery usage chart in Settings now shows users usage for the last 24 hours or 10 days. New dictionaries that gives a Hindi-English bilingual dictionary and a Hebrew dictionary. English Thesaurus provides synonyms and the related concepts for words. One of the major changes that iOS 12 bring along with the best features mentioned above are the ability to make users life easier and more useful. With iOS 12, Apple has set a benchmark in modern developing field. We, at Latitude Technolabs Pvt Ltd, feel responsible to follow the exact same by providing best iOS applications worldwide. Let our support team know if you have any idea that needs any follow up.